Two for Tuesday! 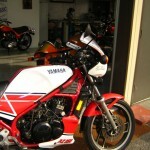 A pair of Yamaha RZ350s for sale! 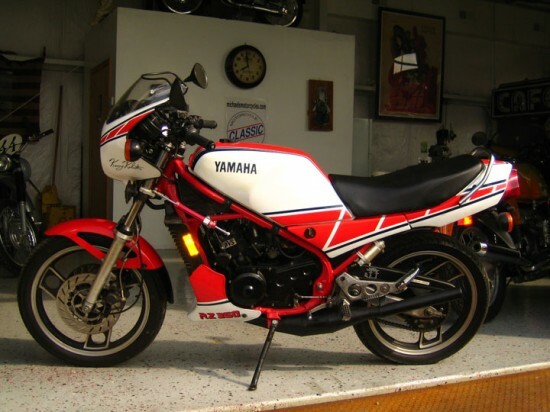 From two different parties come these two fantastic Red/White 1985 RZ350 two strokes! 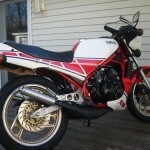 The RZ 350 was the spiritual successor to the RD series two-stroke lineage. Powered by a parallel twin, liquid cooled two-stroke with Yamaha Power Valve System (YPVS), the RZ350 was originally released in Yellow/Black livery with Kenny Roberts’ signature on the fairing. Long regarded as the last major two-stroke imported into the United States, the RZ came stock with catalytic converters hidden in the twin exhaust pipes to try to squeeze the bike through EPA testing. 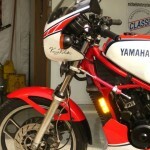 As these pipes are heavy and impede performance, they are often the first to go; it is rare to find an RZ complete with the original OEM exhaust system. 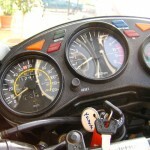 In terms of performance, the RZ was admirable – but not exceptional. It struggled to keep up with period 550cc middleweights of the day. Modified bikes (porting, carbs and expansion chambers) pull far stronger than stock, however, making a well-tuned RZ a potent performer despite the diminutive displacement. It all ended too soon: the EPA choked off the last of the factory two-strokes after only a short 2-year run in the US. 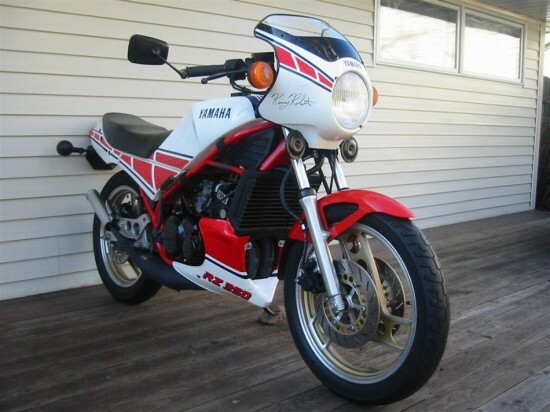 While other countries and regions continued to enjoy the RZ (also badged as the RD350LC) for several more years, the RZ is relatively rare in the US. There were a fair number of them sold during their brief heyday, but to find one in decent condition today is difficult. As a result, values on the RZ continue to slowly rise. 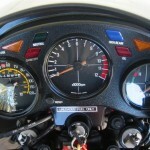 We have seen RZs on our sister site RareSportBikesForSale.com to go between $3500 and $9,000 depending upon conditionn. 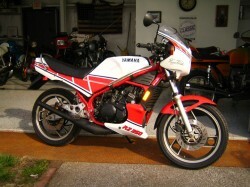 The first RZ in today’s post is a 1985 Yamaha RZ 350 in the red/white color scheme. Sporting some minor modifications (note the steering damper on the left side as well as the aftermarket exhaust), this bike has less than 13k miles on the odometer and looks to be in very clean shape. Great little bike,fast. Frame number JYA48H000FA012575,Engine number 1WT016510. Everything works. Clear title in hand. The second RZ in today’s lineup is another 1985 model in the same Red/While livery. Again, this bike has been modified from stock via the addition of Toomey exhaust – and likely has some jetting changes as a result. 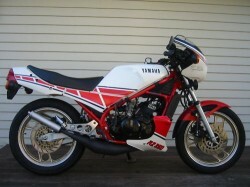 The aftermarket for the RZ was initially very big, and Toomey was one of the top brand pipes of the day. Sporting less than 12,000 miles on the clock, this RZ appears to be well taken care of and ready for a new riding partner. 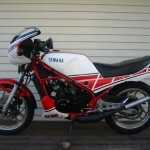 Super Clean, all original 1985 Yamaha RZ350 Kenny Roberts Special. This bike has been carefully stored and maintained. The bike runs perfectly and carbs have recently been cleaned, you will not be unsatisified! There are only two small scratches on the bike that were diffuclt to photograph but are available upon request. The motorcycle has less than 12K miles on itand a Toomey Racing Pipe Kit. This 2-Stroke street machine is a thrill to ride and offers a ride that is difficult to equal. We hope you enjoyed our Two for Tuesday selection this week. Don’t forget to tell ’em that you saw it on CSBFS!